Context: Penetrating neck injuries involving the major vasculature is associated with high morbidity and mortality. This report describes a challenging case in which ligation of the left common carotid artery (CCA), left internal jugular (IJ) and direct tamponade of the left vertebral artery (LVA) was necessary after a patient sustained a stab wound to the left neck. Case Report: A 23 year old male sustained two stab wounds on the left side of the neck severing the CCA, LVA and both jugular veins. Patient arrived unconscious and with obvious signs of hemorrhagic shock. Neck exploration resulted in ligation of the left CCA, both jugular veins, and direct tamponade of the LVA within the vertebral canal. Post-injury day 2 patient required emergent craniectomy secondary to large left hemisphere infarct along the distribution of the left middle cerebral artery (MCA) with an associated large mass effect. Neurological sequelae included seizures, aphasia, and right sided hemiparesis throughout the following week. Six weeks of combined occupational, physical and speech therapy resulted in the patient regaining free movement of his right arm. Conclusion: Penetrating neck injuries (PNIs) are amongst the most lethal traumatic injuries. Surgical management of vascular injuries to the neck, especially the carotid injury consists of primary repair or revascularization strategies. However, while ligation of vessels are typically associated with poor outcomes this still remains a surgical strategy in life threatening situations. Morbidity of ligation of the carotid artery is dependent on collateral cerebral circulation. IJ ligation is generally well tolerated, however it can be associated with transverse sinus thrombosis and increased intracranial pressures. 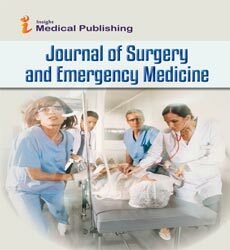 Tamponade of the vertebral artery with hemostatic agent is an acceptable surgical management followed by prompt angiographic evaluation.